Whether sanding furniture to paint or stain, here are easy tips to make your next furniture project go smoothly! 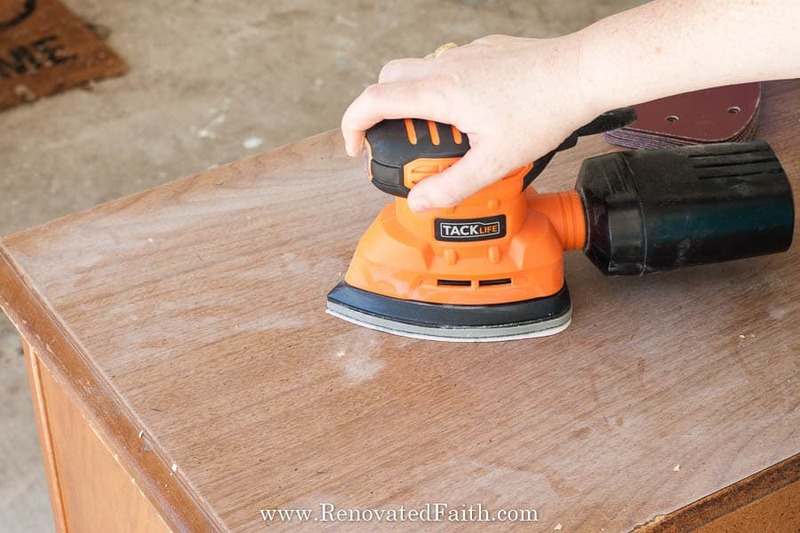 This simple tutorial shows you how to use an electric sander, how to sand spindles, which grit of sandpaper to use & how to prep furniture before using primer. 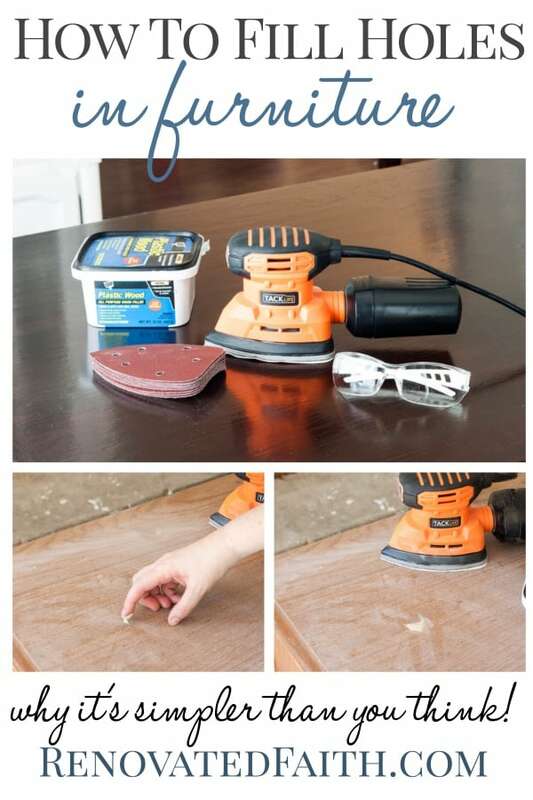 No matter your furniture piece, these DIY tricks will show you how to sand furniture the easy way. 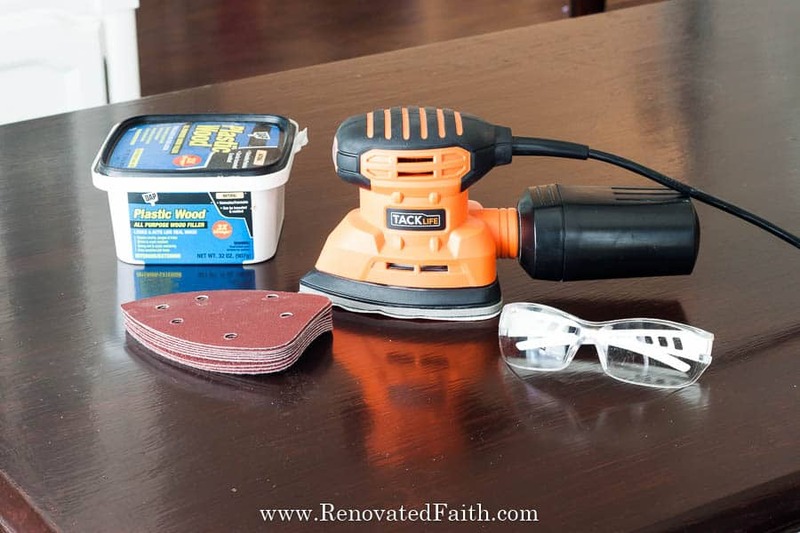 ✅ If you are in a hurry, here is my secret weapon when it comes to furniture sanding. Click here for the current price. This post may contain affiliate links at no extra cost to you. See my full disclosure here. With the introduction of chalk paint, sanding has gotten a bad wrap, but I don’t think it’s quite the headache many have made it out to be. In my post, Why I Don’t Use Chalk Paint, I show you how to refinish furniture without the expense of chalk paint and hassle of waxing. There, you can read multiple reader comments on their experiences with projects where they didn’t sand. It’s not pretty. 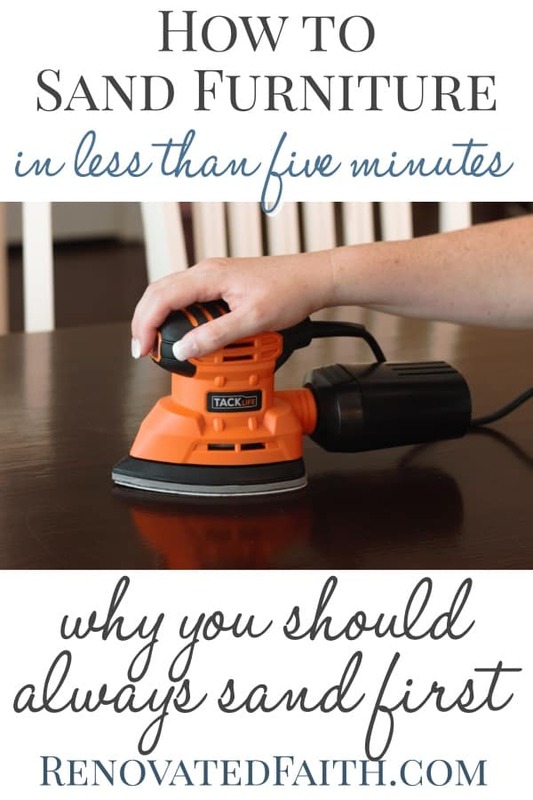 Sanding a piece of furniture shouldn’t take more than 5 minutes. 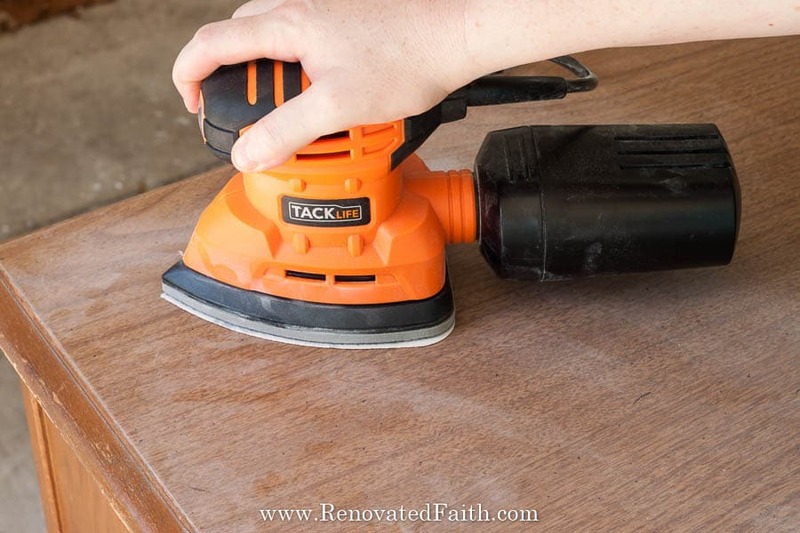 When you picture yourself sanding a furniture piece, you might envision yourself sanding away with a small piece of sander for hours in an effort to get every bit of old stain or paint. If that was the case, I can tell you I would want no part of refinishing furniture! 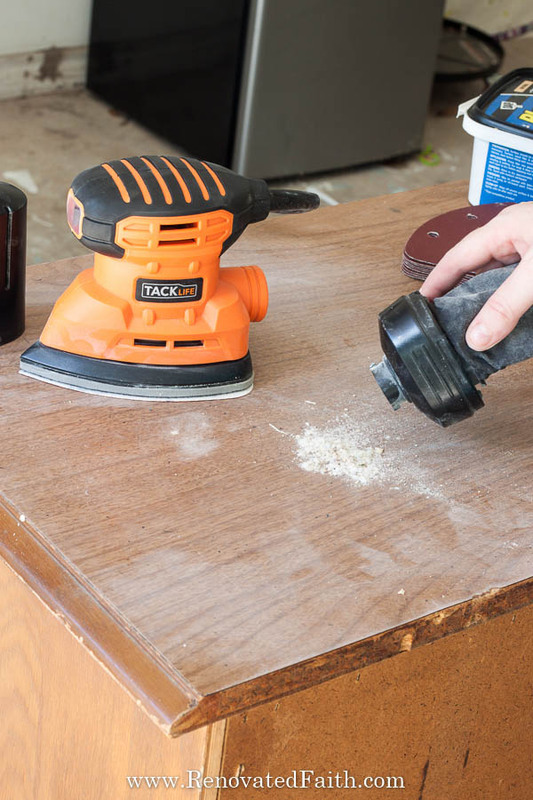 Sanding a furniture piece should never take more than 5 minutes. When prepping a piece for paint, you are just roughing up the surface slightly so that the paint will “stick”. If the existing surface is shiny, the paint won’t have anything to grab onto. Therefore, you are giving the surface some “tooth”, as they say, so the new paint will adhere. What if you want to sand stained wood in order to re-stain a piece? 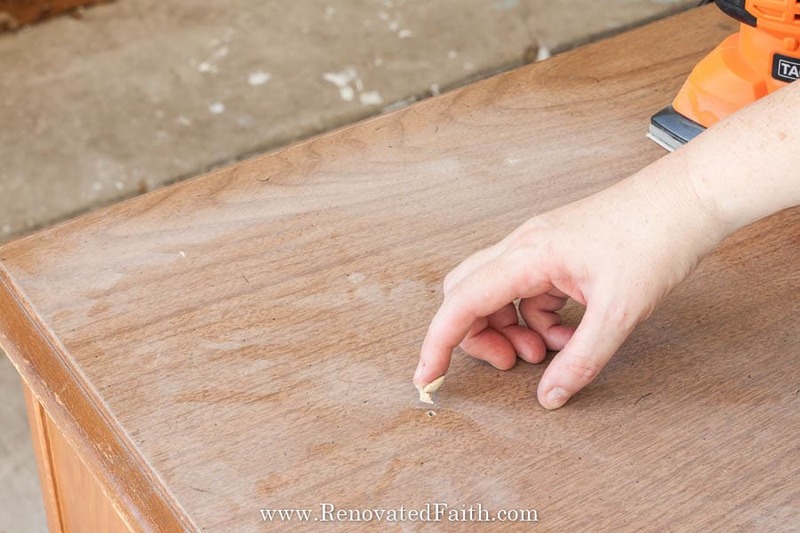 In my post How to Gel Stain Furniture, I give you step-by-step instructions on how to re-stain furniture without having to use furniture stripper and minimal sanding. 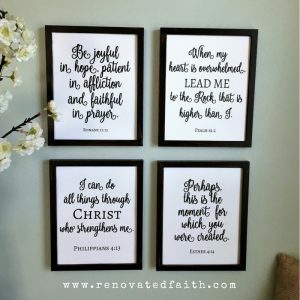 (You can visit out Renovated Faith’s YouTube channel here). Electric Sander or Sanding by Hand? 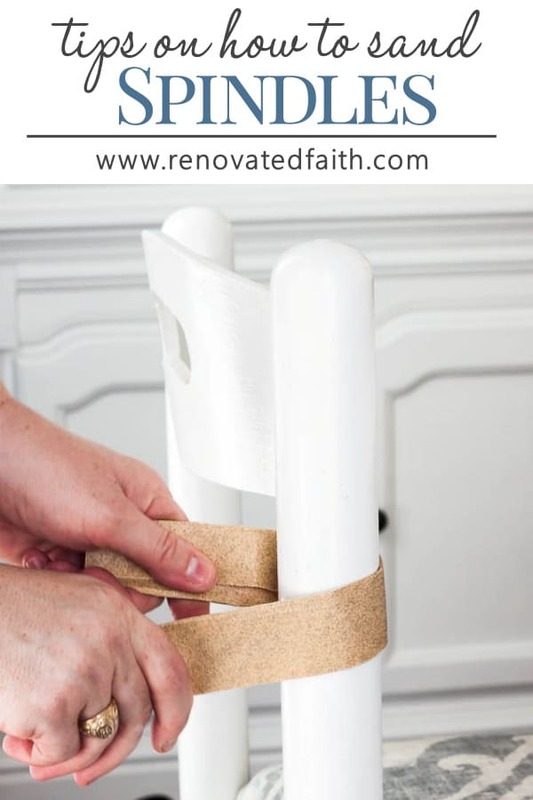 There are times when you have to sand by hand with a piece of sandpaper and we will discuss that more below, as well as how to sand furniture with spindles. Whether you use an electric sander or sand by hand, you want to use the correct grit for your project. 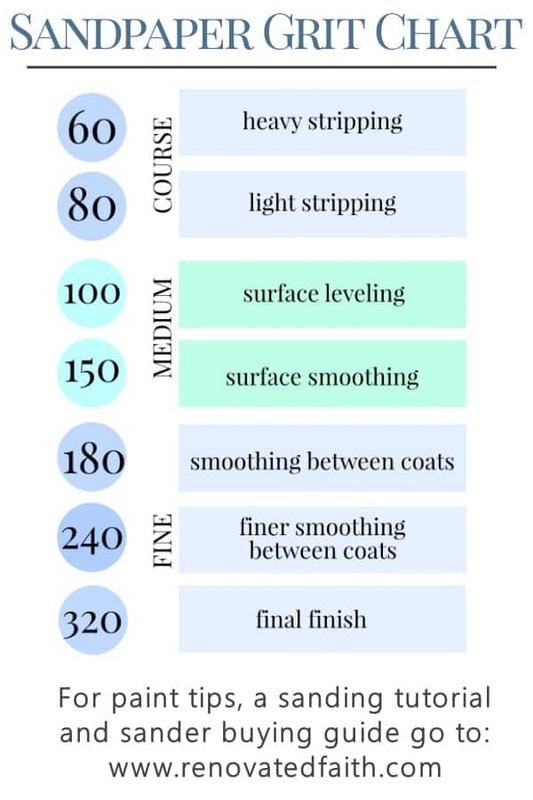 This sandpaper grit chart goes into detail about which grit is best for what kind of surface. Remember, the lower the number the rougher the sandpaper. The rougher sandpaper is to be used on rougher surfaces and the smoother sandpaper is for smoother surfaces. The vast majority of the time I will use a 100 grit sanding pad first to prep the surface and will finish with a 240 grit. 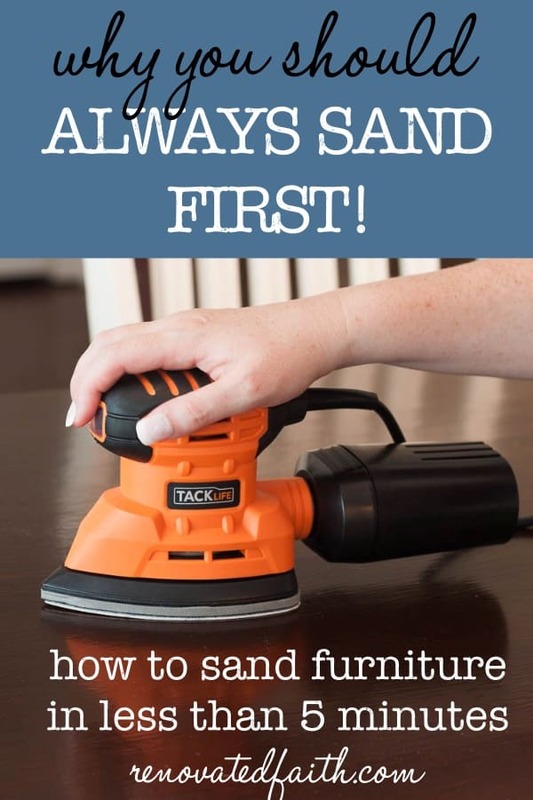 Can you sand furniture indoors? 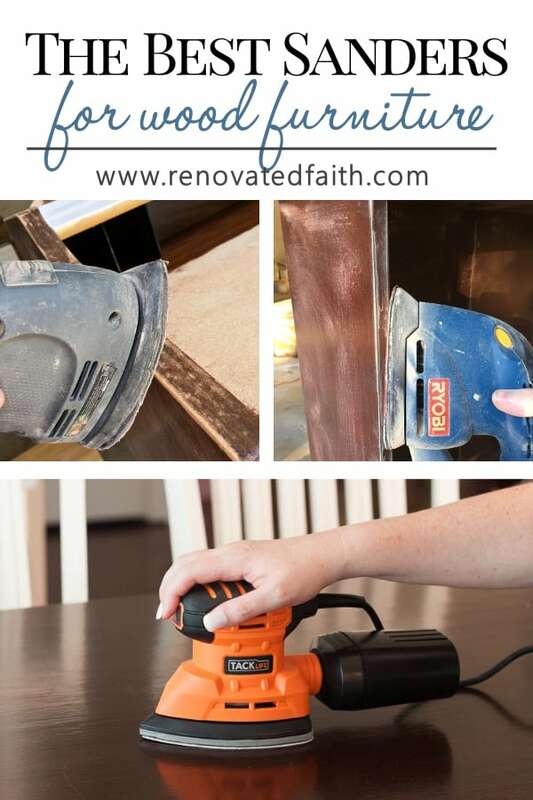 When sanding indoors, dust is always going to be a factor but I will show you can minimize dust with a dust catcher or be attaching your sander to a vacuum cleaner. In most circumstances, I’d recommend sanding outdoors or in your garage. However, sometimes sanding outside is unavoidable. 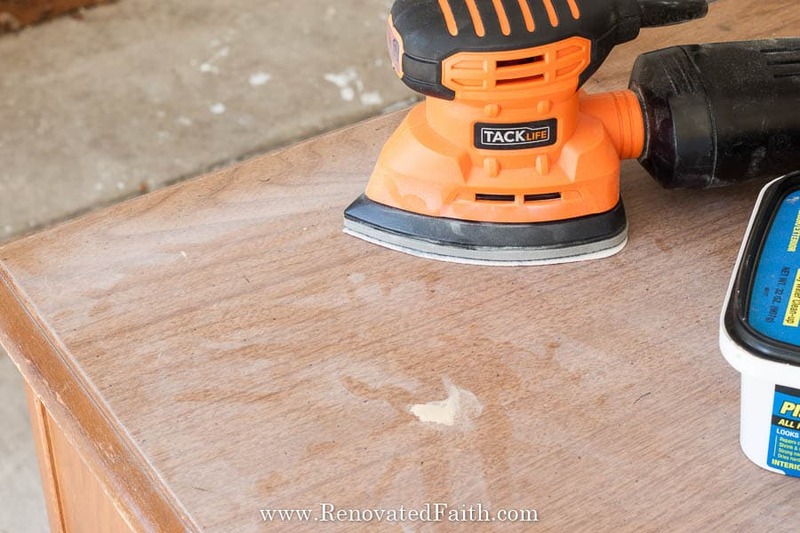 If you are sanding by hand, you will have some dust but it can be easily picked up with a vacuum as soon as you are done. 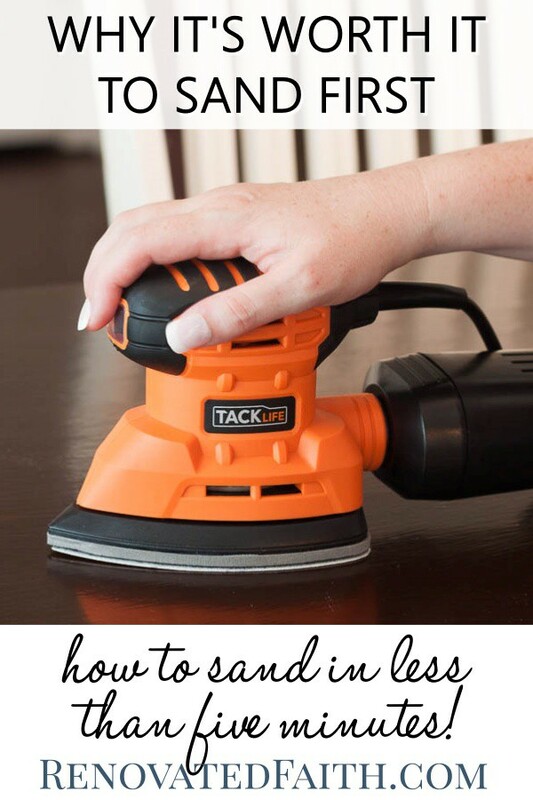 If you are using an electric sander indoors, the vacuum attachment is a must and even then you will get some fine dust in the air. I plan to use my vacuum attachment for my electric sander when it comes time to sand the cabinet boxes in our kitchen for painting. You can see in the picture allow how much dust the dust catcher collects. It catches most of it but you can see there is still dust on the surface of the dresser. Electric Sander – I’m using this one. Check the current price here. You can also click here for my post on the best sanders for wood furniture. One is less than $15! 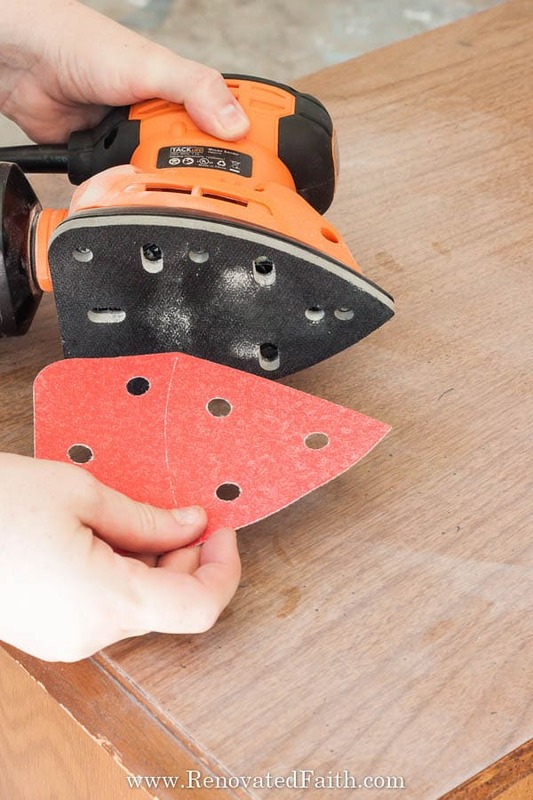 Sanding Pads – I like this set. Click here for current price. Wood Filler (optional) – This brand is my favorite. You can also find it at Home Depot. Disposable Masks – These are great because they are easier to breath through and not as hot. Safety Glasses – I use these but you can get them anywhere. Respirator (optional) – I bought this one because I can use it with heavy sanding and also to protect me from the fumes of oil-based paints and stains. Check out the best prices for sanders here. Click HERE to read my post on the BEST sanders for furniture. Before sanding a furniture piece, check for any deep gouges, cracks or dents. You want to fill those with wood filler to get the best finish possible. You want to add enough wood filler so the level of the filler is a little higher than the surface of the wood but not so much that it is globbed on and you have to sand a lot off later. Let that dry 48 hours or for however long the directions say. Wood Filler Applied – Let it dry at least 24 hours. Now it’s time to sand! If you can use an iron, I PROMISE you can use an electric sander. It is by far the easiest and safest power tool you could use. Be sure to put on your safety glasses and sanding mask to protect your eyes and lungs from dust particles. The viewer assumes all responsibility and liability associated with the hazards of woodworking. Renovated Faith is not responsible for any errors or omissions that may be present in this tutorial. She also assumes no liability for any action or inaction of a viewer. Please use extreme caution when using power tools. Read your tool manual thoroughly and wear protective safety gear. Take your time familiarizing yourself with a tool before using it. 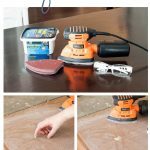 Using a rougher sanding pad, place it on the bottom of the sander as it just velcros on. I like to use a … sanding pad for my first pass. Remember the lower the number, the rougher the sandpaper and the surface. Then, I use a circular motion and go over the whole surface to get out any irregularities in the surface and to sand off the excess wood filler. You can see how I sanded over the hole I filled with wood filler. Sand the flat surfaces and don’t forget to pass over the edges of the furniture too to make them smooth. You don’t want to round them necessary but just sand them slightly to remove any rough edges or burrs. After the first pass with the rough sandpaper, you can replace the sanding pad with a smoother one. I like to use a … grit sanding pad for my final pass. This time you want to go with the grain of the wood to leave a smooth surface that your paint or stain will adhere to. Now that you have finished your final pass, wipe down the surface with a damp rag and you are ready for furniture paint! If you are wondering how to refinish furniture, I use a simple process that is easier and cheaper than chalk paint, that you can see here. If you are wondering how to sand wood by hand, the same rules still apply as sanding an electric sander. You want to start with a rougher grit of sandpaper and then on your last pass, sand along the grain with a smoother grit. 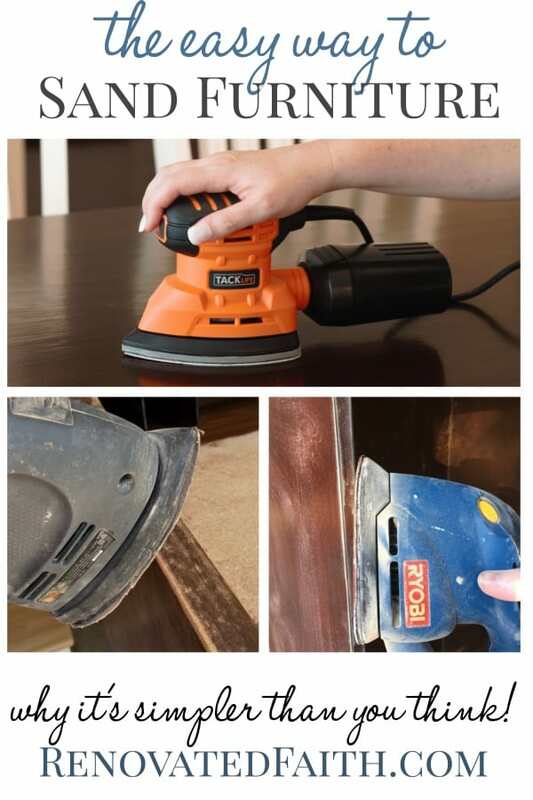 For sanding detailed furniture, you want to use a smoother grit sandpaper and lightly sand in the grooves and details. Detailed furniture will not need as much sanding in the first place because the paint will naturally adhere to the details of the wood, which will hopefully make refinishing antique furniture easier. Often times, I get asked how to sand chairs with spindles or how to sand spindle table legs. Unfortunately, you can’t use an electric sander on spindles but I do have a trick to make it go faster. Fold over a sheet or piece of sandpaper until you have a long piece about the shape and length of a ruler. Then, wrap it around the spindle and move it back and forth. Revolve the sandpaper around it once or twice. Remember you are not trying to take off paint, just rough up the surface. For laminate furniture, I’d sand over the piece a couple times with a very rough sandpaper, like a 60 or 60 grit. Laminate is very smooth and you want to make sure the paint sticks to it. Then use a good primer before painting. In my post, How to Paint Laminate Furniture, I share the full process and some tips to make laminate look like painted wood. 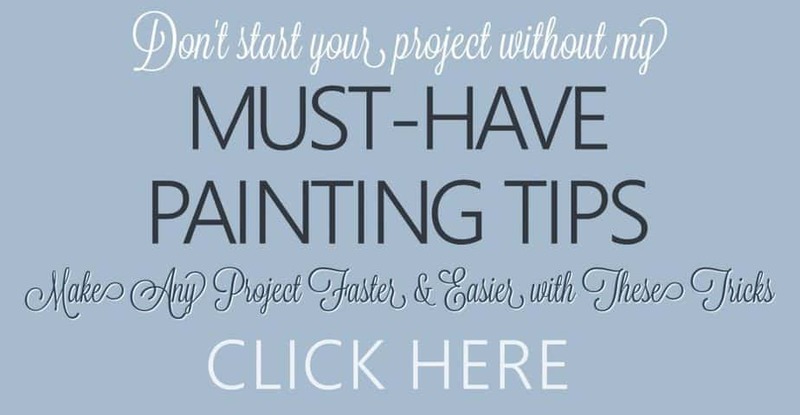 You can also check out my BEST tips for painting furniture below. They will save you a ton of time and give your furniture piece a beautifully smooth finish. 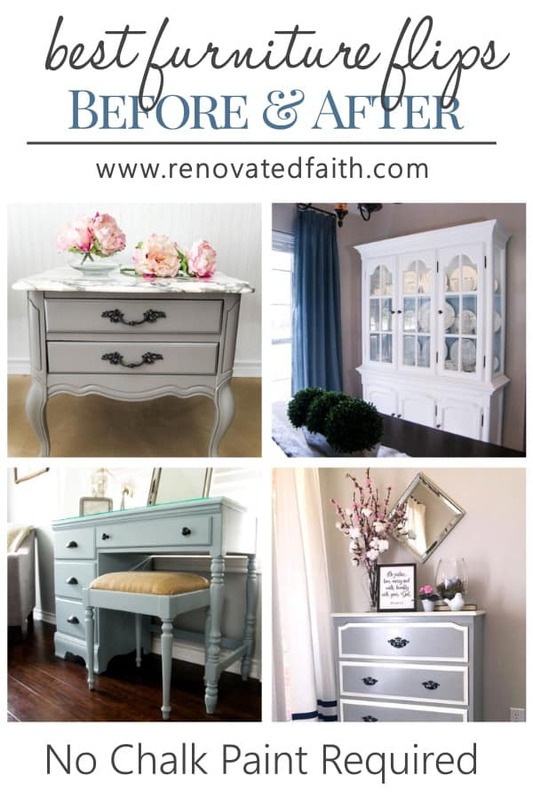 See my favorite diy furniture makeovers HERE including before and after photos. If you have any other questions about sanding furniture, feel free to ask in the comments question! I’d love to help in any way I can. What type of sand paper would you use for veneer? Great question. I would use a very rough (lower number) sandpaper – like a 60 grit to really rough up the surface and right after that use a finer sandpaper to level it a little bit. You want the surface to be level but not slick. Let me know if you have any other questions.